All Saints' Church01621 854179work ChurchThe oldest surviving feature of this beautiful church is the unique triangular tower, dating back over 850 years. All Saints Church has a rich collection of memorials to famous people and events in the town. The beautiful stained glass Washington Window is a gift from the people of Malden Massachusetts to commemorate the American connection to the town. The church is the burial place of the great-great grandfather of George Washington, first president of the United States, who was rector of nearby Purleigh Church in 1633. There is a monument to Thomas Cammocke who brought the water supply to Maldon, and the church is the burial place of the famous Fat Man of Maldon, Edward Bright, who weighed 44 stone when he died. The exterior displays statues of the Founding Fathers of Maldon including Byrhtnoth, killed at the Battle of Maldon in 991, and the town’s greatest benefactor Dr Thomas Plume. While away an hour or two and learn more about Maldon’s history. Open all year, the church is well worth a visit. The oldest surviving feature of this beautiful church is the unique triangular tower, dating back over 850 years. All Saints Church has a rich collection of memorials to famous people and events in the town. The beautiful stained glass Washington Window is a gift from the people of Malden Massachusetts to commemorate the American connection to the town. The church is the burial place of the great-great grandfather of George Washington, first president of the United States, who was rector of nearby Purleigh Church in 1633. 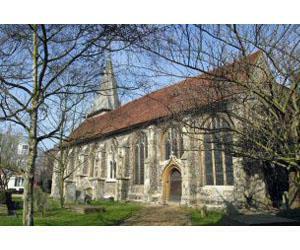 Our church is situated in Maldon High Street at the junction with Silver Street. Like most churches, we do not have our own postcode but if you are using a SatNav and want to find us, enter CM9 4QE. This is the code for the Blue Boar Hotel and Thomas Cook travel agents which are in Silver Street opposite the church.